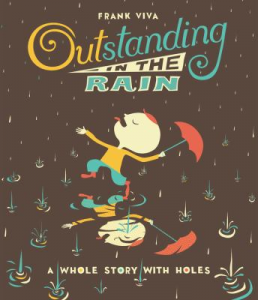 An oronym is a set of words or a phrase that sound exactly like another set of words or a phrase, such as “ice cream” and “I scream.” The picture book of this week, Outstanding in the Rain, is not only full of fun oronyms, but the pages also have holes that peek through to the page beneath to alter the illustrations. Described as “a whole story with holes,” this is one you have to check out to see for yourself! Frank Viva’s unique style lends a fun look to the interesting word play and illustrations of this title. You may recognize some of his work – he designed artwork for the New York City transit system as well as advertisements for a broad range of companies. While it’s a little hard to create a truly captivating story that relies on strange wording techniques and missing pieces of pages, Oustanding in the Rain is short, sweet, and creatively clever. Posted in Kids, Reviews and Recommendations. I love this book! A great example of a book that can only be appreciated in print.